Winter is coming. OK, so the White Walkers might not be invading, but someone else is. 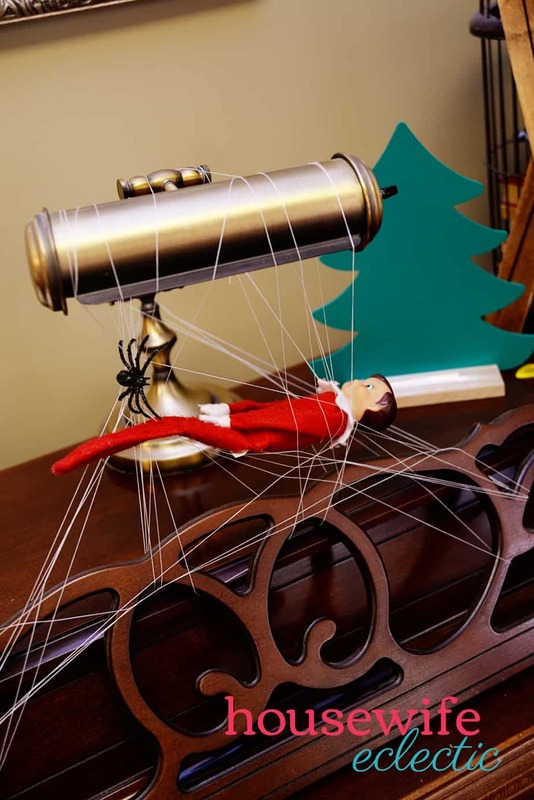 Your Elf on the Shelf. If you are like us, you started this tradition looking for a Christmas magic and ended up more work than you bargained for. Here is our list of creative and fun but EASY (except for maybe the outfits, but I am working on printables for you!) 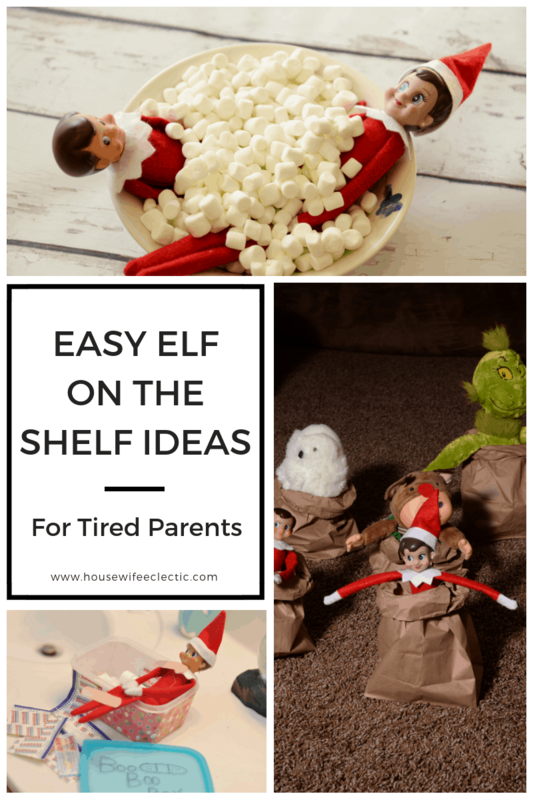 ideas that any tired parent can pull together for their elf! 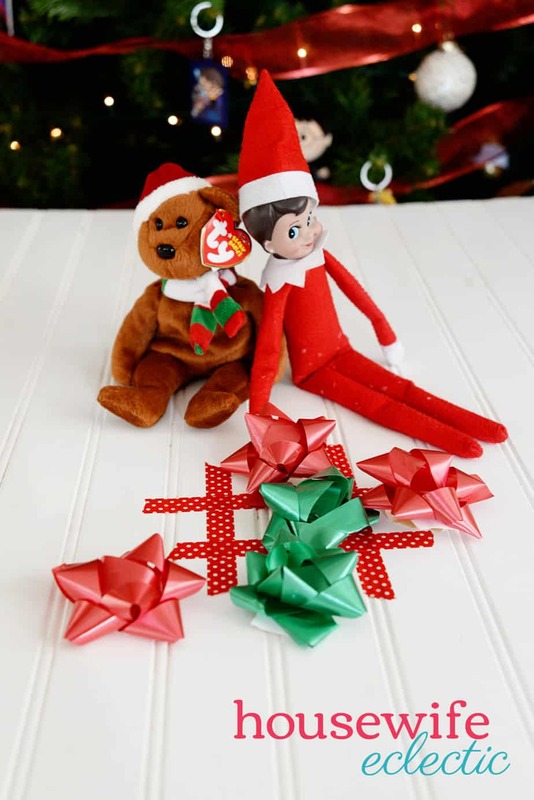 Each one of these takes just a few minutes and your Elf will be ready to go! 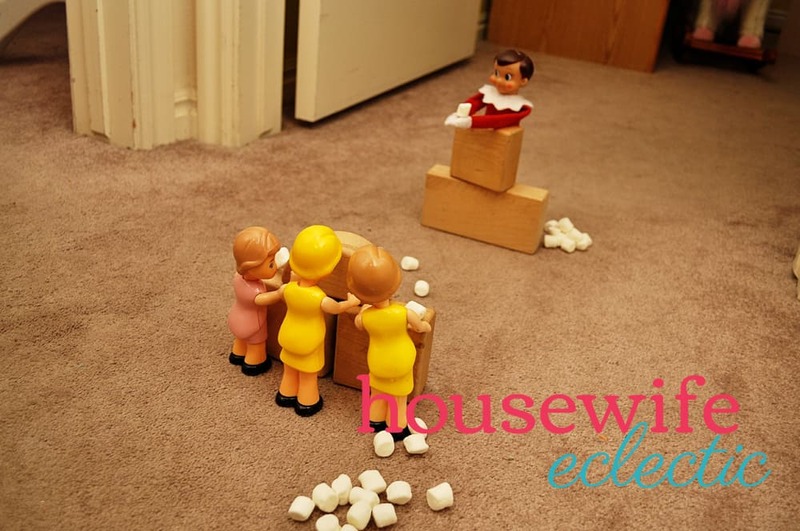 Make sure you have your elf on the shelf! 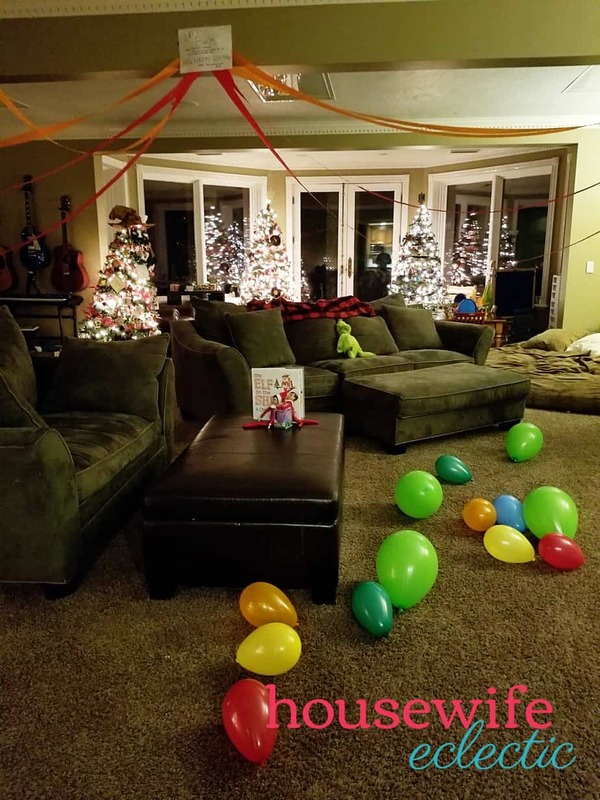 Blow up a few balloons and leave them all over the floor. Add a few streamers to the ceiling and walls with a sign that says I’m Back! 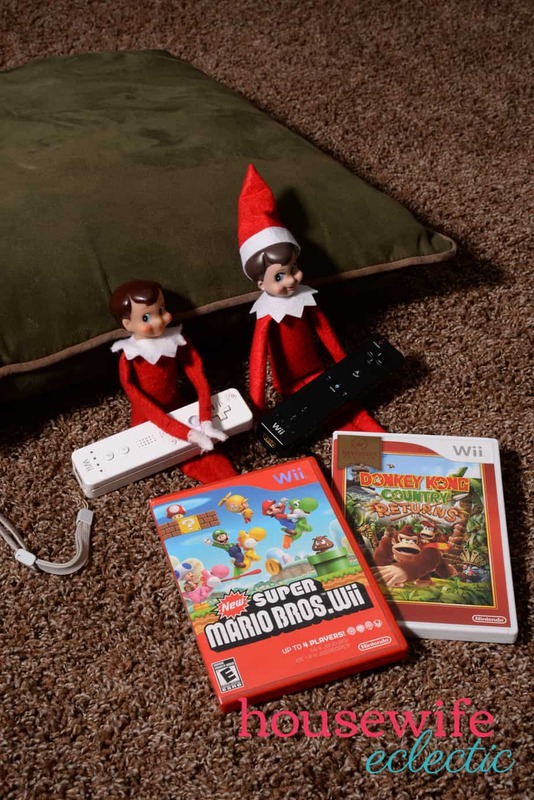 Set up the game like your elf is playing with a few stuffed animals! Don’t have any board games? Use a video game you have laying around. Better yet, make life really easy and do both! A board game one night and a video game the next. 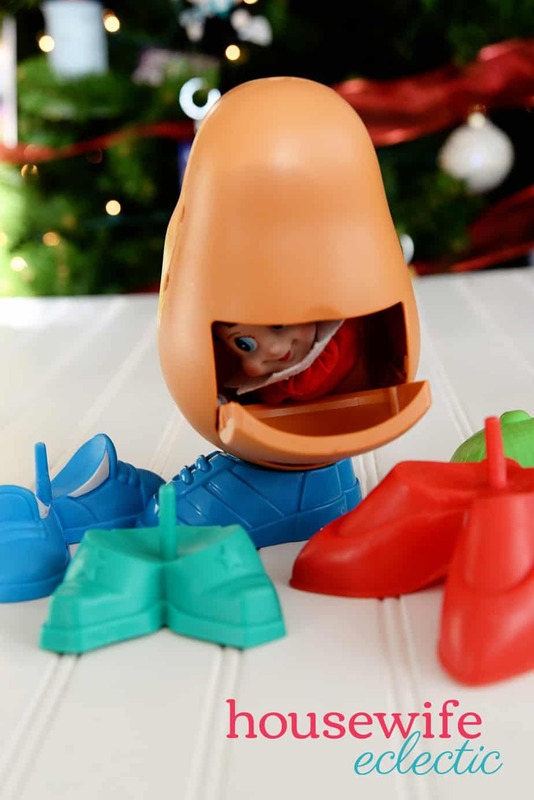 Open a couple of Band-Aids and stick them to your elf. Leave the rest in their packages on the counter. This is a fun time to give your kids a box of character band-aids if you want to, but not necessary. 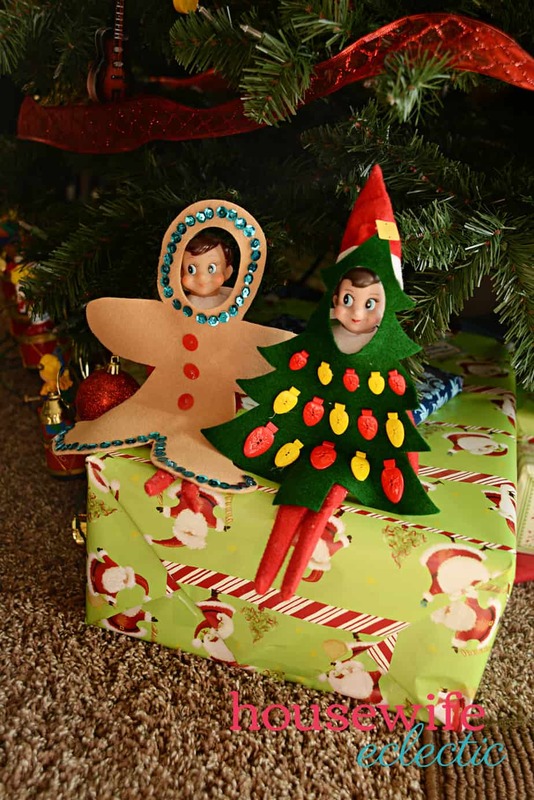 Color a few scribbles on a coloring page and then put the crayon in your elf’s arms! Tape vertical streamer across your child’s door so when they wake up they have to walk through them. 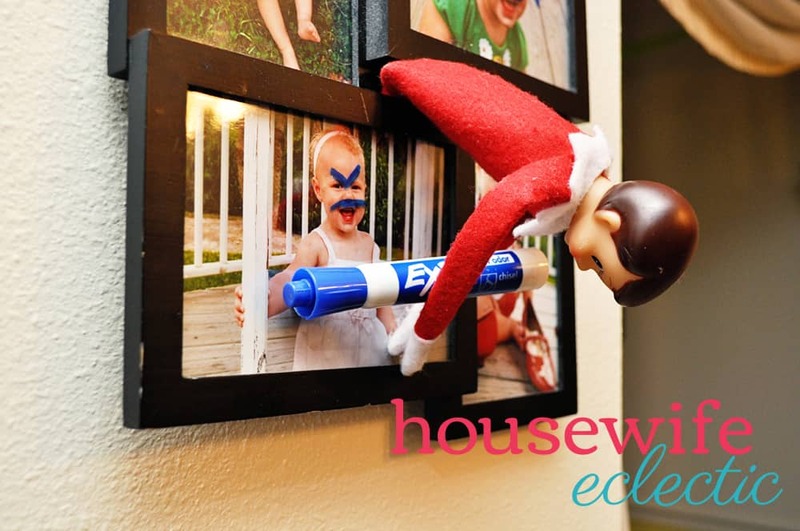 This is one of my kid’s FAVORITE things that their elf does! 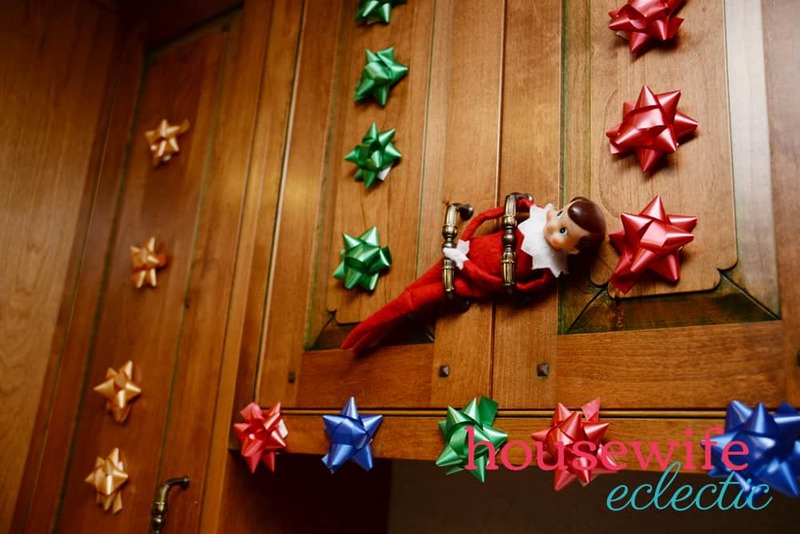 Stick the bows all over your kitchen cupboards! 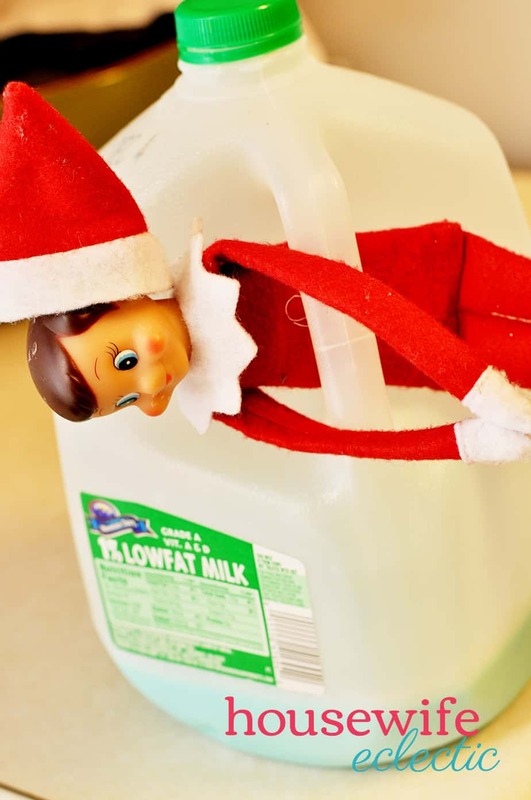 Color your milk and then stick the elf in the handle. I recommend doing this when your milk is almost gone in case your kids won’t drink blue milk! If you don’t want to worry about making your costumes, you can buy a pre-made costume here. 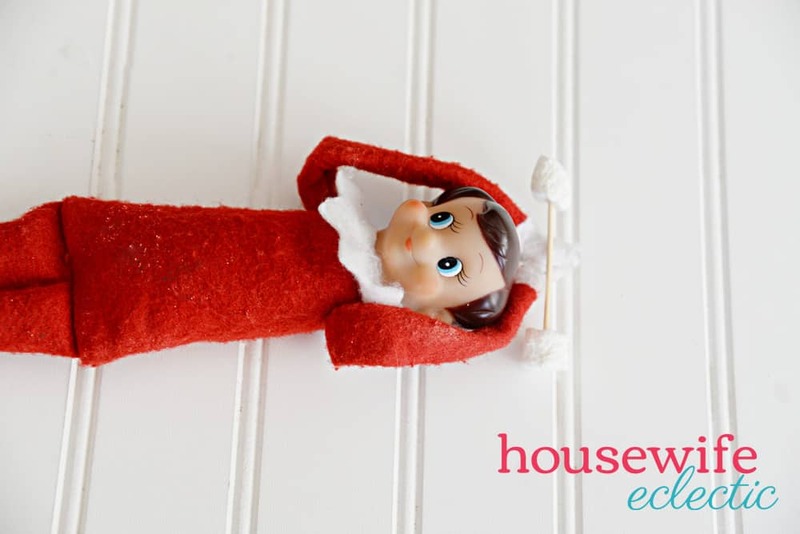 Lay your elf down on a piece of paper and trace! 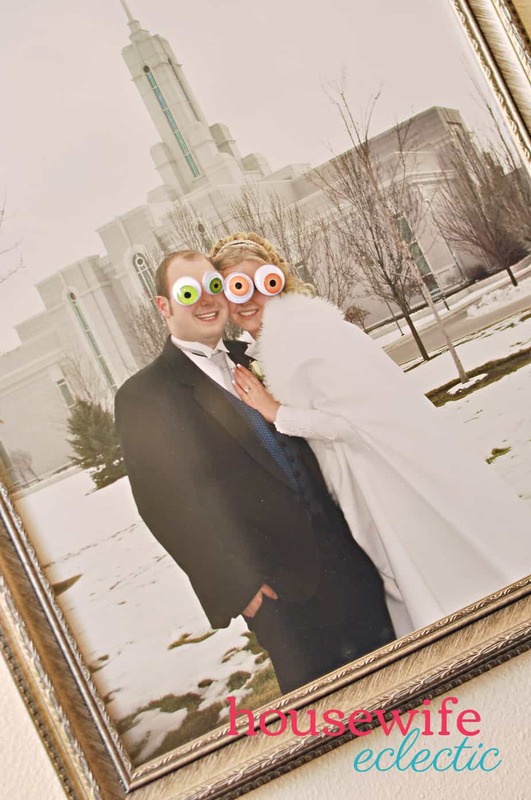 Tape google eyes on pictures, fruit and anything else you want to! 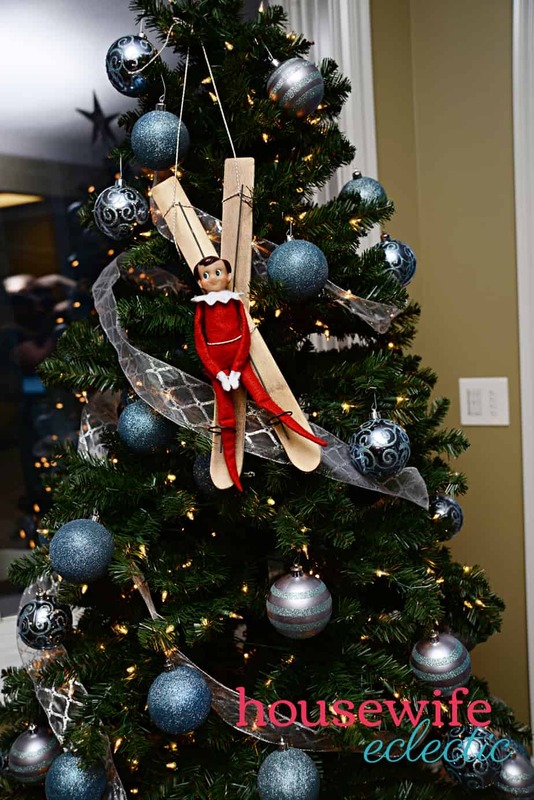 Tie a string to your Christmas tree and have your elf slide down your tree. If you have small skis or a sled, you can add those too. 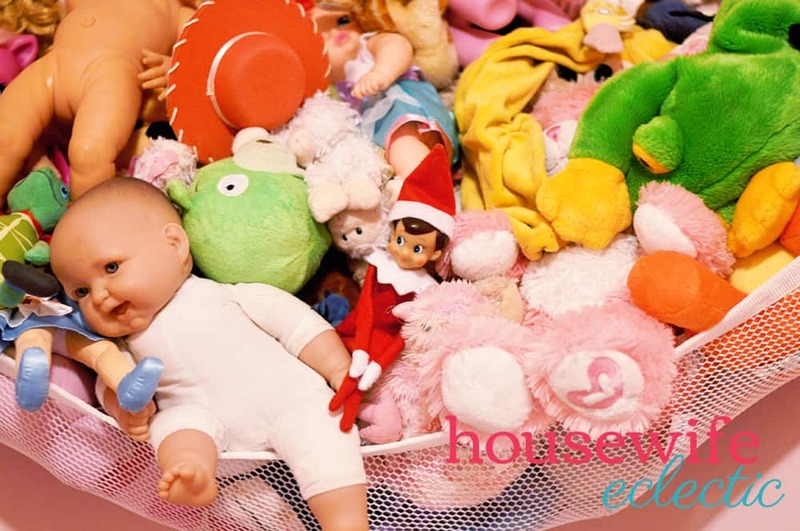 Stick your child’s elf right in the middle of the stuffed animals and see if they can spot them! 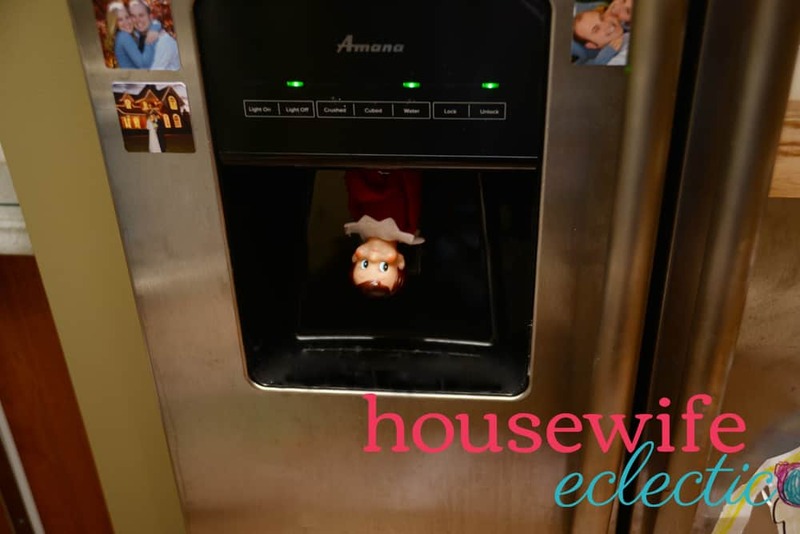 Stick your elf in the ice maker in your freezer or even put them in an ice cube tray! 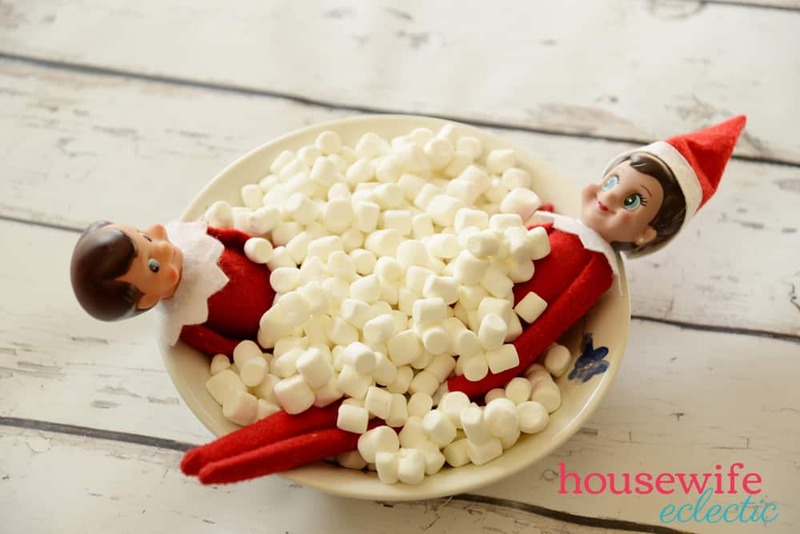 Fill a bowl with marshmallows and add your elf! 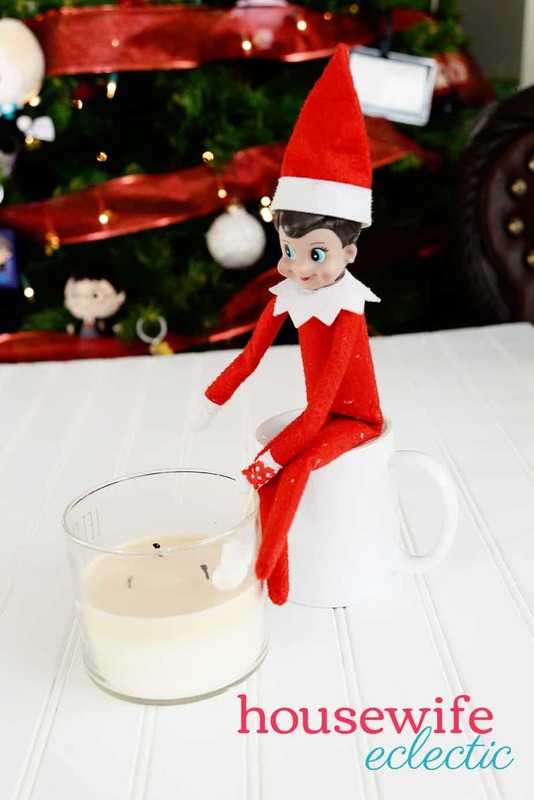 Make sure to add marshmallows on top of the elf too! 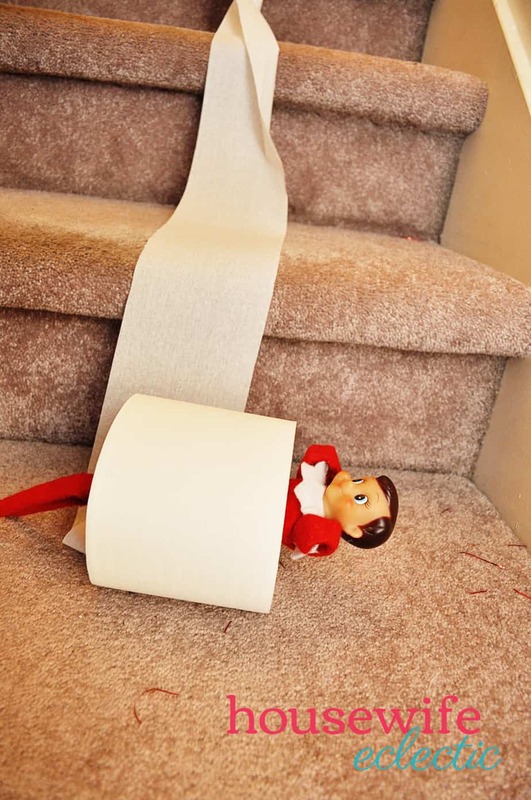 Stick your elf inside the roll of toliet paper and roll it down the stairs, leaving a trail of paper behind! 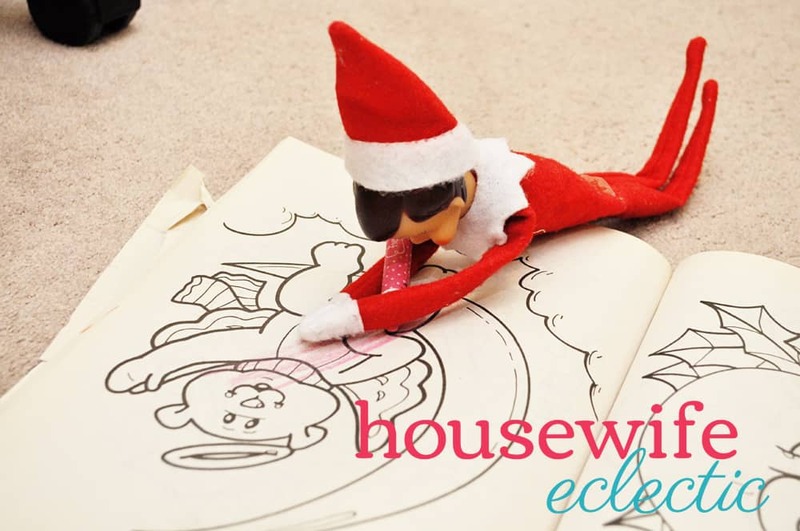 Draw silly pictures on the glass and leave the elf nerby with the marker! 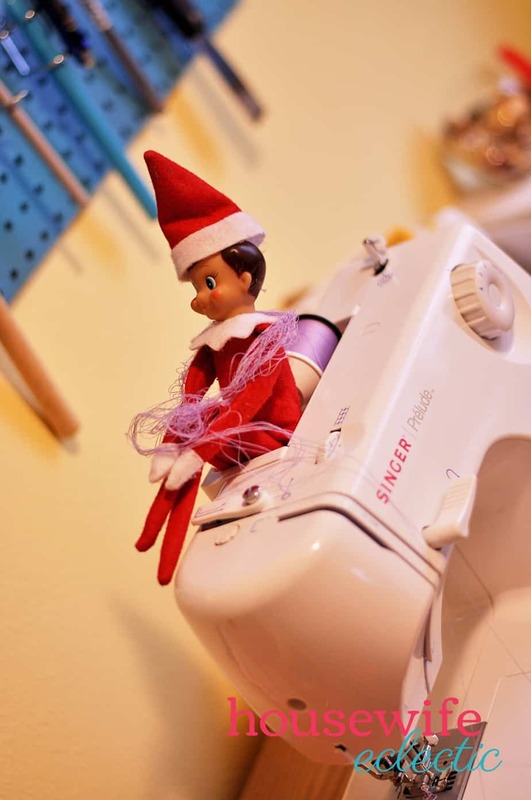 Wrap you elf up in a spool of thread. If you have them leave a needle and scissor nearby. 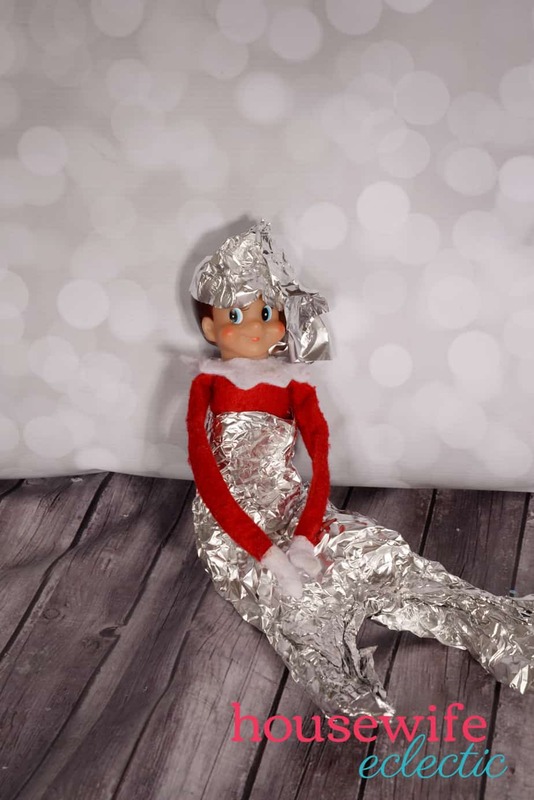 Make your elf a stylish Alumnimum foil outfit! 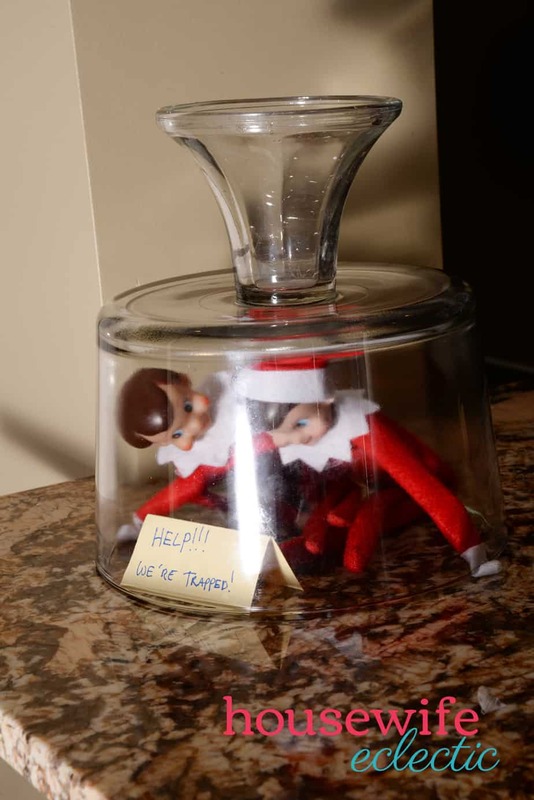 Stick your elf inside a glass jar with a sign that says they are trapped! This is another one that always cracks our kids up. 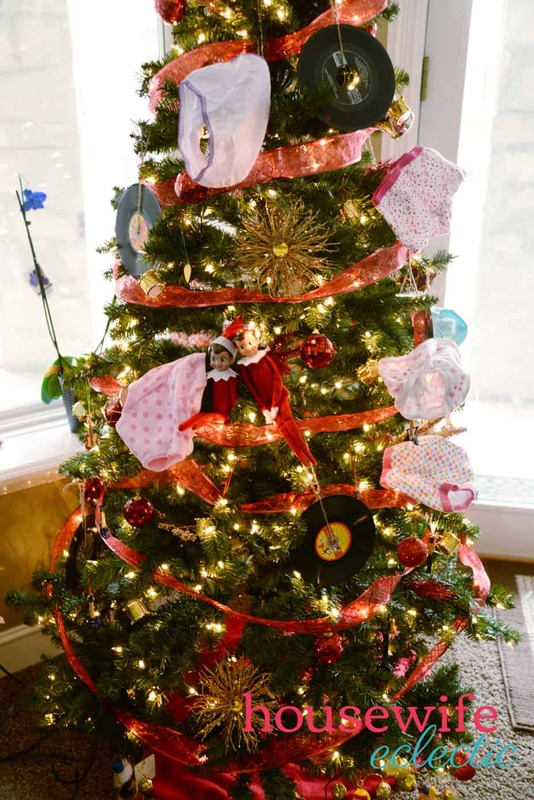 Add some underwear to the tree! 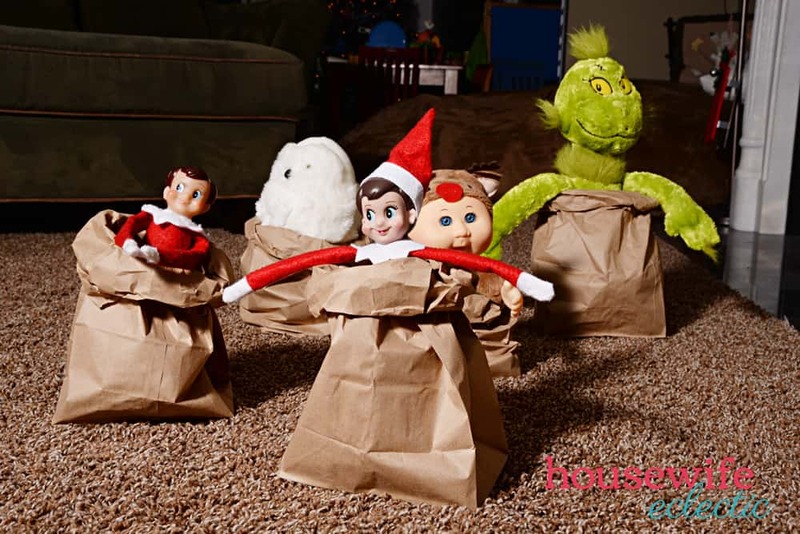 Roll the top of the paper bags down and stick stuffed animals inside of them for a sack race! Day 22: Stuck in a spider web! Wrap the string around to places in your house like a spider web. Between two chairs works great! Add a spider if you have one! 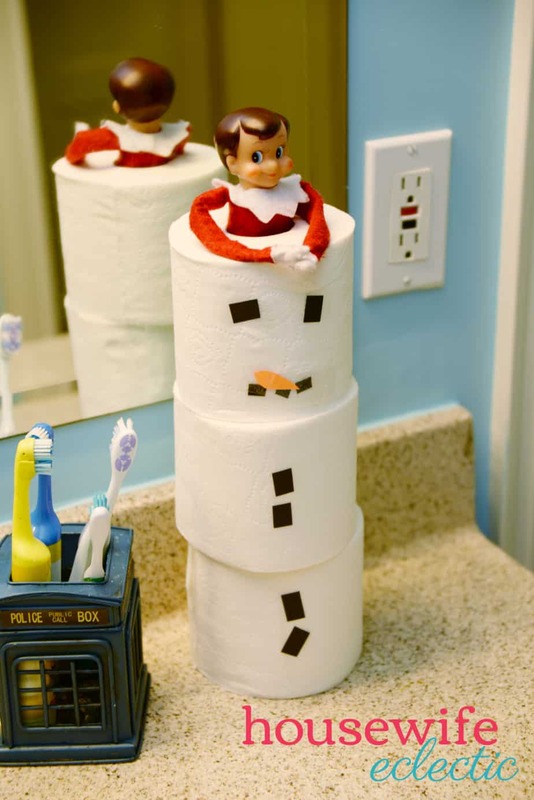 Stick your elf inside three rolls of toilet paper stacked on top of each other. Cut small squares out of black construction paper and a triangle out of orange and tape them to the toliet paper. 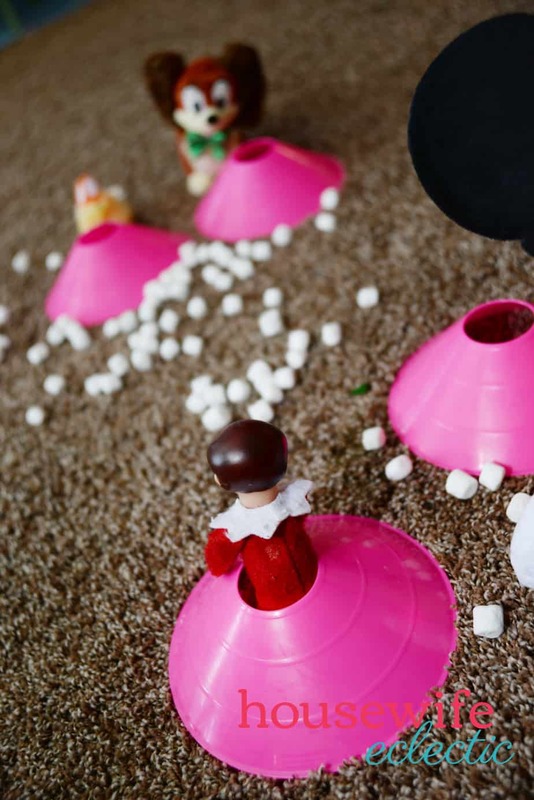 Set up small barricades for your toys and elf to hide behind and then sprinkle marshmallows behind and between the two. Don’t have blocks? I have also done this one with soccer cones. 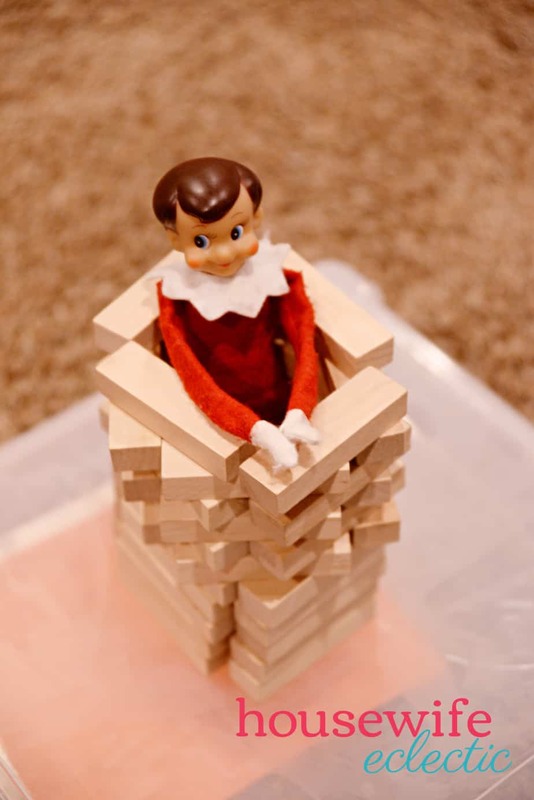 Build your Elf into a Jenga tower! 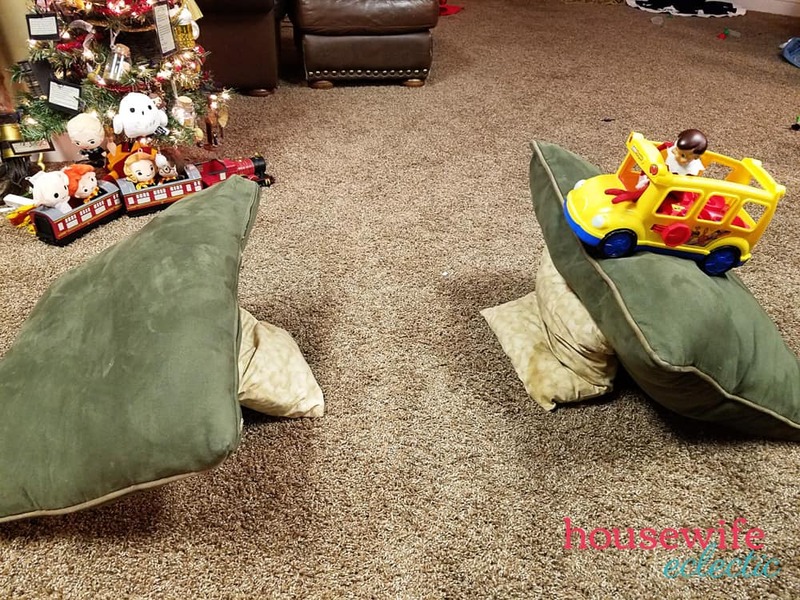 Build a Jump ramp with pillows and a larger toy vehicle! 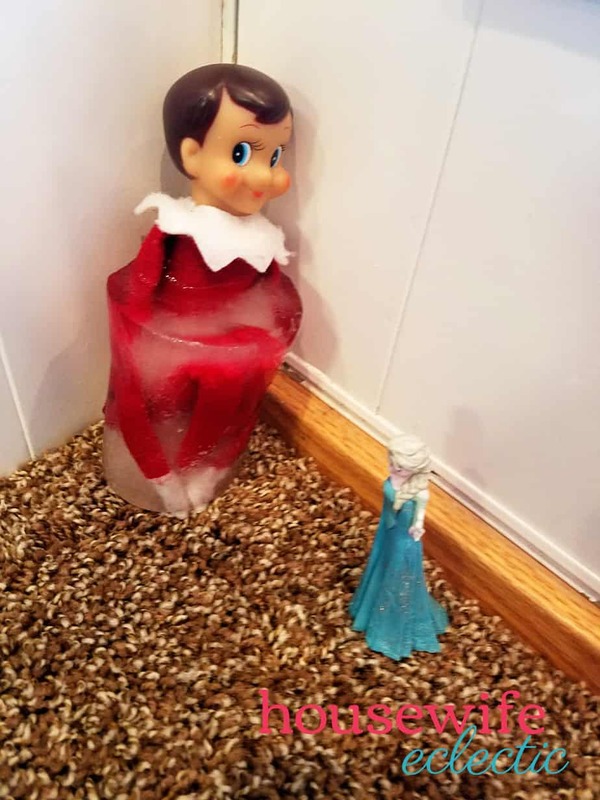 Freeze your elf in a cup of water and set it out with an Elsa Figurine. 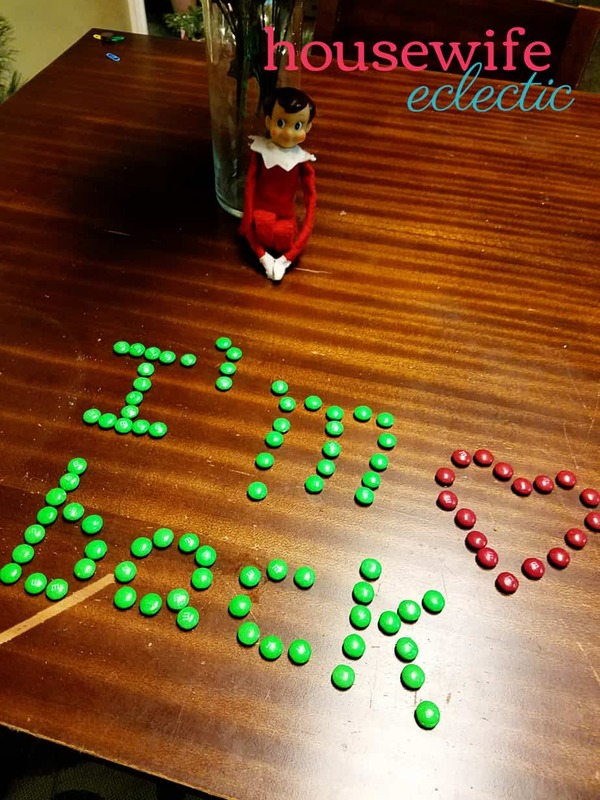 Write I’m Back in M&Ms for a welcome back night! 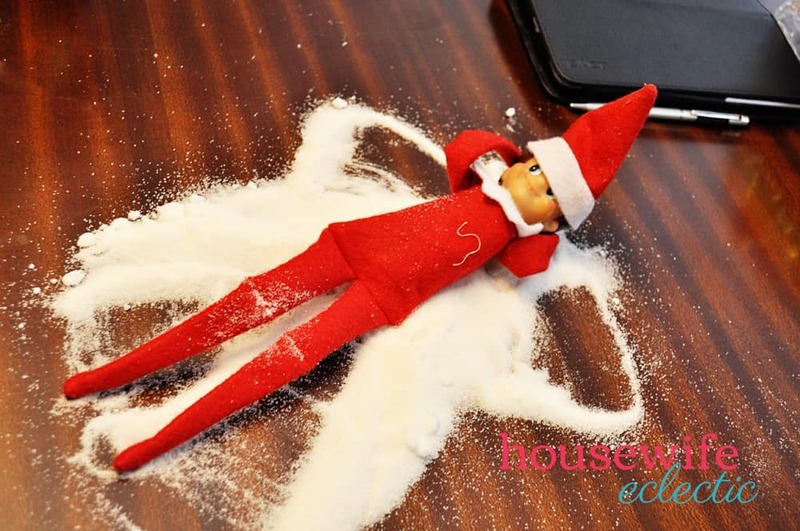 Cleaning Elf! 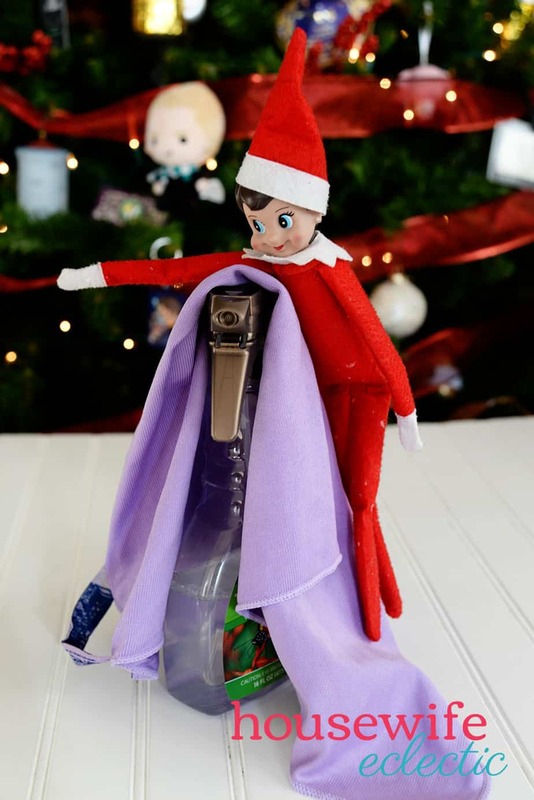 Elf with cleaning supplies. 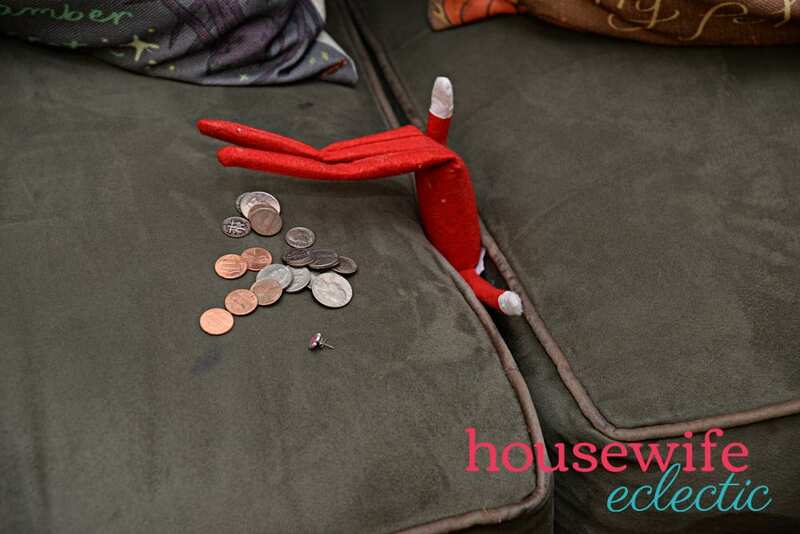 Add some change to your couch and your elf searching in the cushions! 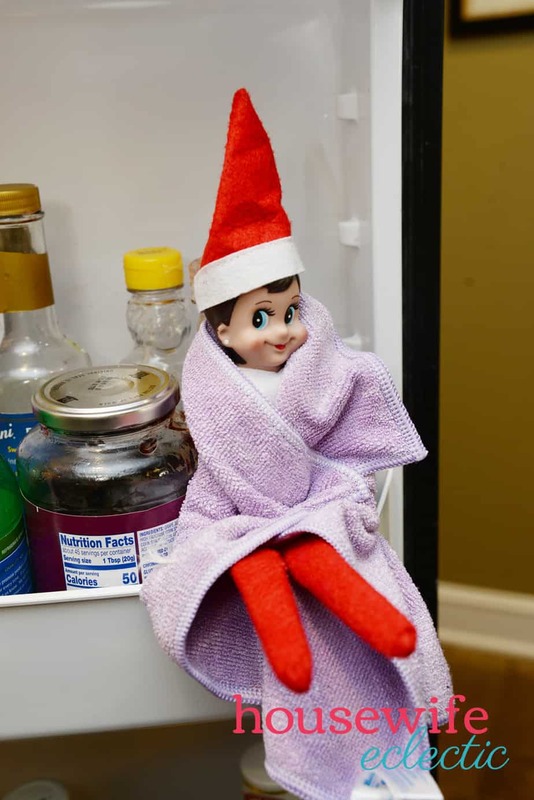 Wrap your elf in a towel and put them in the fridge! 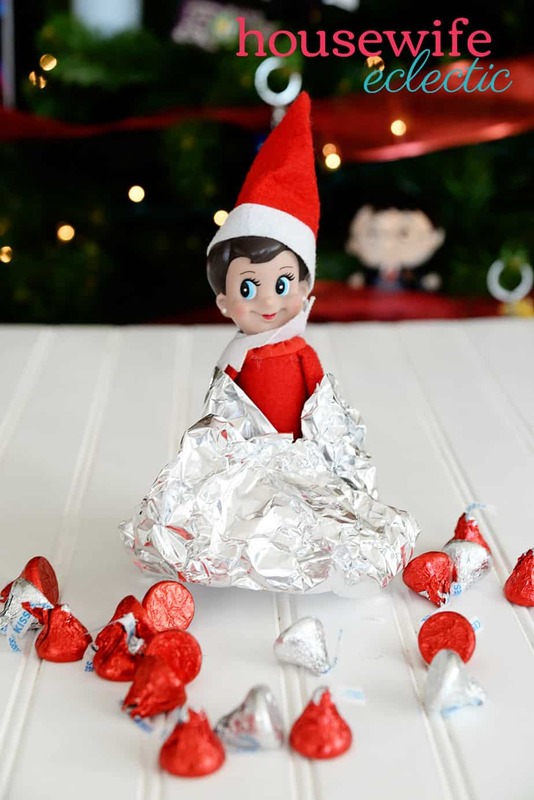 Wrap your elf like a Hershey Kiss and then surround them with the candy! 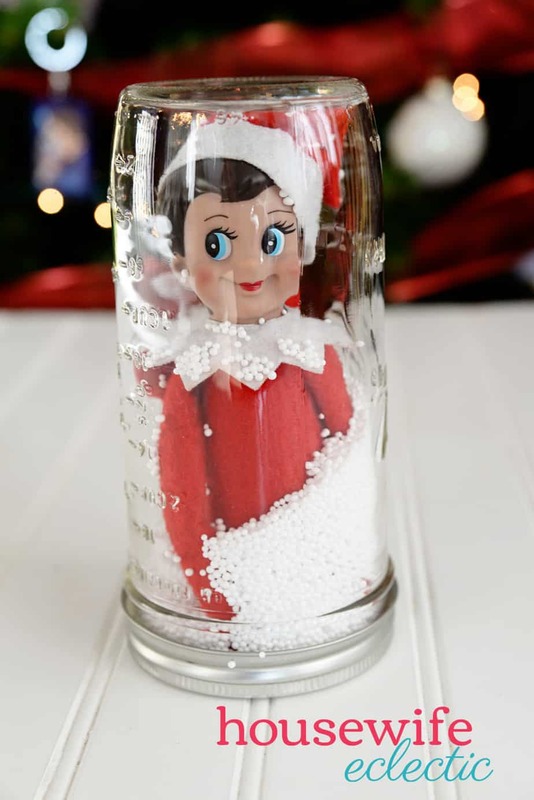 Snowglobe elf! All you need is some faux snow and a mason jar. 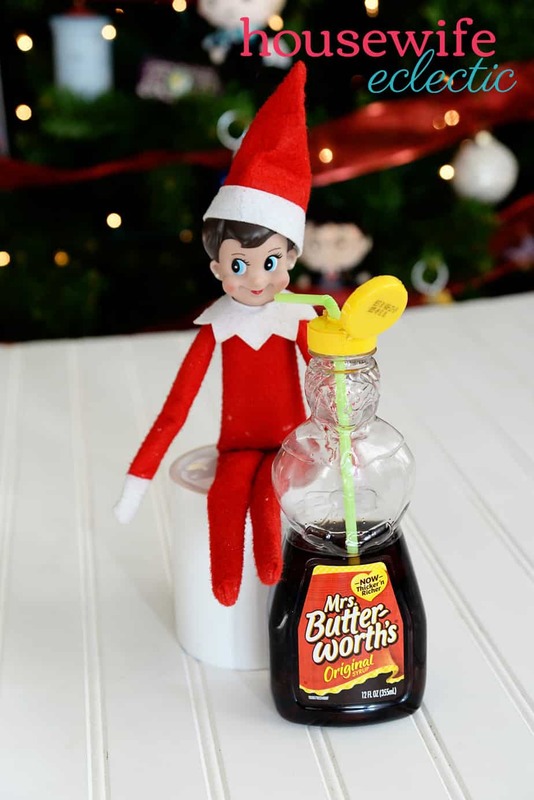 Elf drinking syrup. A bendy straw keeps the straw from sinking all the way in! 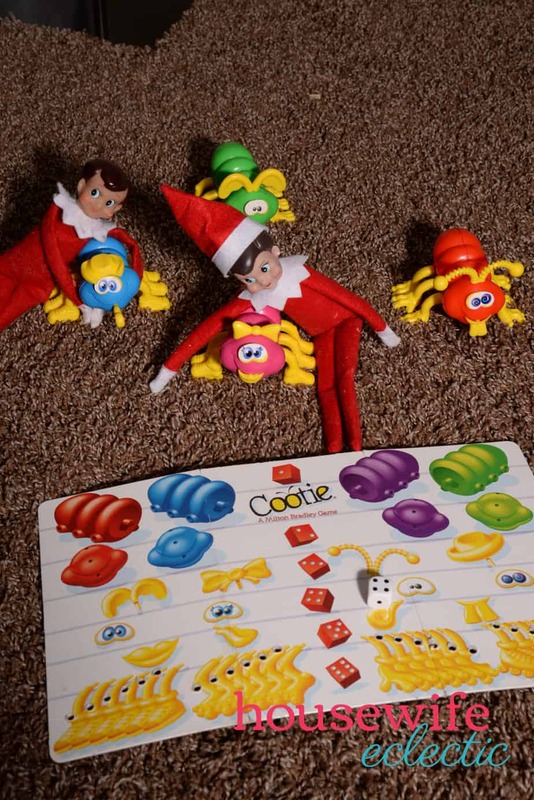 Tic Tac Toe Elf. Washi tape and bows for a cute elf day! Elf Lifting weights. Two small marshmallows and a toothpick!